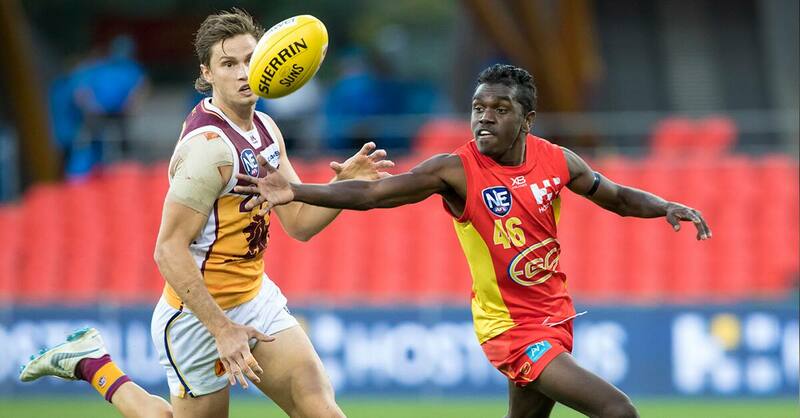 Saturday's NEAFL derby against the Gold Coast Suns at Metricon Stadium is a must-win for the Brisbane Lions who sit in equal sixth place on the ladder, ahead of the GWS Giants on percentage. If the Lions beat the Suns and the Giants lose to the Sydney Swans on the weekend, a spot in the finals is all but secured, barring a disastrous final round result. The Suns sit in eighth place on the ladder, six points adrift of the Lions, and will be desperate for a victory to stay in the hunt for a finals berth. The Lions have won all three matches against the Suns this year, with their most recent win by 12 points three weeks ago at Metricon Stadium. Apart from missing Zac Bailey who has returned to the Senior side, the Lions' team is relatively unchanged from their big win over the Swans two weeks ago. Ryan Bastinac and Sam Mayes return, while promising Academy players Connor McFadyen and Tom Matthews are also inclusions. Bounce is at 3.45pm on Saturday at Metricon Stadium. Gates open at 3.40pm and fans require a ticket to the Senior match to access the stadium. Queensland full-season Lions members will be able to gain entry to the match by scanning their 2018 membership card at Gate 1 or 3.